Ok guys, I'm just going to start a thread with all my findings, success' and failures in the search for a homemade China Globe option like we say in the American Hustle thread. Of course name brand LiteGear ones here http://store.litegear.com/product_p/lrp-vho60-x3-1m.htm. I also found some cheap Chinese ones from Amazon Prime. Why did I pick these? If they are defective or don't put out the correct light described, I can send them back easily. This only applies to the US folk, sorry about that guys. Anyways, here's a few links to the ones I'm trying out. I'm going to start off with #1 above as they came in first. I'm not going to get to into the design and build quality at this point as I'm just evaluating whether these cheap LEDs can even be used. If so, relatively easily, we'll get into the other stuff. Tonight I just did a down and dirty test with the Pocket Cam and the Sigma 18-35 shooting ProRes 800asa at 3200k in Film Log. I just stood in a blacked out room and held the strand of LEDs about 12-16 inches from my face. Once again, just trying to get an idea of whats going on. Here's a some screen grabs of before and after a quick grade. Update: The third pic is the first rigged up piece. I'm powering it off of one of my batteries I used on my GH2. Works prefect and the mic stand holds it well for testing. Think I might be on to something cheap and useful here. Now obviously the first one is what we might call a tad bit green :) It's odd because on the vectorscope, it's really not learning towards green too bad. And the second one is a little too red. I'm trying to figure out how to build a housing inside the china globe to allow me the ability of wrapping the whole interior with some 1/4 minus green. Second Test after I rigged up an internal pod for the LEDs to be contained in, then wrapped it with 1/4 minus green. Getting there. Once again, the untouched file and a quick BS grade. Off to bed. Digging these tests, thanks for doing this. Not following the other thread but kudos for taking the initiative to test and thanks for posting your methodology/results. I've actually been looking into China Balls as well. I'm using the same Ikea ones you are, too. I really, really hate low CRI lighting. Even HMIs look off to me - I'd rather go with gelled tungsten, even though output is drastically reduced. The only thing that comes close, in my opinion, is remote phosphor technology - what Area 48 and Cineo Lighting is doing. But the tech is currently a little expensive. Because of that, I've been looking for the best standard incandescent bulbs I can find. Photo floods are probably best, but I was trying to find something that lasted longer, since they're being used for a cheap photo studio, and that I could find locally (which ended up being Home Depot.) The best I found were these: http://www.homedepot.com/p/GE-200-Watt-Incandescent-A21-Soft-White-Light-Bulb-200A-W-TP1-6/100140577# - 3400 lumens and 2900k (although mine I rated at about 2725 in Resolve) with soft light. And also this one: http://www.homedepot.com/p/GE-300-Watt-Incandescent-PS25-Crystal-Clear-Light-Bulb-87847/100493736# - 6100 lumens at 130 volts (you'd need a step up transformer) or 4650 lumens at a longer lasting 120 volts (normal outlet voltage ranges from 110-130v). It ended up being brighter than the 200w, but it was also harder (as it was clear) and warmer. If you do end up trying this out, don't use Ikea's socket for the bulbs, as they are only rated up to 75 watts. Filmtools has sockets for China Balls, but you could also use this: http://www.homedepot.com/p/Leviton-White-Outlet-to-Socket-Light-Plug-R52-00061-00W/100170446# combined with a locking extension cord adapter, which Home Depot sells. I ended up going with a brown Leviton adapter right next to the white one (as I didn't realized there was such a thing as a locking extension cord adapter) but that requires you to (somewhat easily) wire it up yourself. It is a better socket, though - rated up to 240v - but the white one seems to be just fine. Since the balls didn't get very hot, what I'm thinking I might do next is maxing everything out with this: http://www.homedepot.com/p/Leviton-Socket-with-Outlets-White-R52-01403-00W/100184555# and two more of the white sockets. Since I liked the 200w better, all three of them would give me just over 10,000 lumens and be just under the 650w max. I'm also thinking I might just get this: http://www.filmtools.com/e.html - this would let me use standard halogen bulbs - which get closer to 3200k or higher (which should be better for color) and give me 60-100% more lumens. However, they will run much hotter (as halogens do), and would most likely be hot enough to burn the rice paper if it touched it. They will also last less than 1/10 of the time the incandescents should last. I'll stick with the incandescents for now. Check out http://www.aliexpress.com/ & http://www.banggood.com/ & http://dx.com/ I've often purchased gear and other random stuff from there, and they sell LED strips super cheaply too, and been thinking about purchasing from them. These CUs, about what distance was the fixture from your face? Doing a quick look at the Amazon pages it was a little hard to judge what the effective wattage might be, assuming the whole strip is used in there. I imagine you're doing a fair amount of experimentation on how to arrange the strip inside the ball. I'm wondering if orientation of the strips inside matters much, like feeding the strip in and letting it randomly clump versus something labor intensive like trying to do controlled loops, hanging in the center or run along the edges. @Joshua_Cadmium This tests isn't about normal china ball rigging. We're all pretty up to speed on those but this is to mimic what we say on American Hustle, hints the term LED in the title. I'm looking to create a cool, soft light globe that can be walked with talent or simple hung on a boom pole without having to tie into AC. These can be run off of small. external batteries, as seen in the quick rig up pic above. @BurnetRhoades In the close ups for the first test, the bare strip was 10" from my face but only about 1-2ft of the whole 16' strip was illuminating me. On the second, the LEDs were in the globe and it was abut the same distance but obviously they took a big hit on actually brightness because of the globe. This strip was just 300 LEDs but I have a 600 sittting here as well as a different color temp 300. I'd imagine a 300 plus 600 would do the trick or if it works decent, 2 600's as the 600's are actually shorter since the LEDs are closer together. As far as arraigning, all I did at first was create a cylinder to wrap the 1/4-green around and just cram the bastards in there. I've been shooting for the past 4 days with a 6am calltime and have 6 more to go. Needless to say I haven't touched em. As soon as I finish, I'll have time to play around with this stuff. I'll do a nicer grade on it as well. I was just trying to get a rich, contrasty look real quick. I feel the 1/4- really helped out. Great work Vic! There is an undeniable magic to the china ball and I'm glad to see some DIY experimentation going on in the LED realm for this! @vicharris --- inspired, I just ordered a lantern and some 90CRI LEDs ! @andyharris Awesome man. What lights did you order? If you provided a link that would help out here too. Like I said I don't have much time right now but I threw in the 600 LED strip along with the 300 and did a quick test. The strength went from 11 1/3EV to 12 1/3 EV at 800asa at 1ft. If the CRI isn't horrible and I really don't know how to to measure that, maybe shoot a color chart in RAW and post the DNG, I'm thinking 4 of the 600 LED strips inside a 1/4-green chamber might be enough light to help out practical lighting props since that was what I was going for. Definitely a great on location or in the woods soft lighting source with the battery option. If anyone else is playing around or finds anything else, please share as I think this is a cool, cheap and mobile solution. Probably great for CUs. Plus I have some RGB Tape left over from another project. The Lantern arrived today, at 1Metre (36") I may have over done it a bit - its huge! For testing I have some nice DC bench power supplies that are very stable with CV and CC controls. I have a little project in mind that would make a sensible test. I have some Dimmable HF Ballasts in the workshop, but I reckon this would take more than a weekend to construct and test. I looked at the Litegear tape that I think you are going test, the prices are good but the UK shipping was more than the tape. @andyharris Ooooooo, I like those that you found. I should order one to see how it matches up against the ones I bought. I'm sure they are better. Also I didn't buy the Litegear ones. They are pretty expensive. I'm just trying out cheap ones right now. So the 2M strip of LEDs have arrived, I've put them on a bench power supply and they drawn about 2.6A at 12.6V which is 32W (was expecting 28.8W). You wouldn't want to look at them for long. I wrapped them around a baked bean tin and this seems a perfect fit -- know what I'm having for breakfast now. Since the strip gets quite warm I'm going to clean the can in the dishwasher then rub it down to roughen the surface a bit. That should help the self-adhesive strip. By the week-end I should have a few photos and by next week end I hope to have done a mini project with the experimental light. @andyharris I'm itching to try this too. It sounds like an awesome addition to the lighting arsenal. Are you planning a mobile (battery) power or mains tethered with transformer? @ahbleza If you check out one of my pics above, you can see how these can easily be ran off of battery power. It's the main reason I started the project. So you can take it anywhere and have a little soft light in a min. @ahbleza I tested at 12.6V which is a 3 cell LiPo. At around 30W a 2100mAh 3 cell Lipo will run for 45 minutes. I have some protectors that will switch off the light around 11.1V to protect the LiPo. @andyharris I have a few LiPos, but didn't know there are problems if you drain them. Thanks for the tip! I bought some LED strip today, and will be starting my own experiments. @andyharris Nice man! How are you finding the color temp and green spike if there is one? I'll have time next week to just back on mine. I feel they are a tad bit cool. Holy crap! Just realized I can't get the ones you bought shipped to the states. Odd. @vicharris On those tests I had to remove a fraction of green --- This is based on doing a 'conform' on a known grey in Resolve - I made the spot on the vectorscope round and in the middle (Is this the right way?). There might be a delay in my next test due to Talent having a nasty cold. The next test may contain a bit of a shoot out between the BMCC and the Canon DC1 which a friend of mine just bought. Cree has demonstrated its first 200-lumen-per-watt (LPW) LED concept luminaire, which offers more than twice the efficiency of linear fluorescent luminaires, according to the company. The 3,200-lumen concept luminaire delivers greater than 200LPW at 80CRI at thermal equilibrium while remaining within the ANSI color specification for 3000K, which Cree said will enable it to deliver increased performance in LED luminaire applications at a lower cost to accelerate LED adoption. 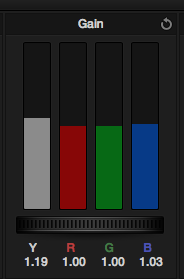 Ok, so far with my brand of lights, which I think Andys might be much better, here's the adjustments to pull it back from any color cast on a 18% gray card. This is with 1/4-green on them. I've included the Vectorscope before the adjustment in Resolve as well. My conclusions are that I need to use a smaller ball so that I can get the drop-off greater (the ball would be closer to the subject). I'll be ordering a 20" ball when I get a moment.